Item # 308675 Stash Points: 1,395 (?) This is the number of points you get in The Zumiez Stash for purchasing this item. Stash points are redeemable for exclusive rewards only available to Zumiez Stash members. To redeem your points check out the rewards catalog on thestash.zumiez.com. 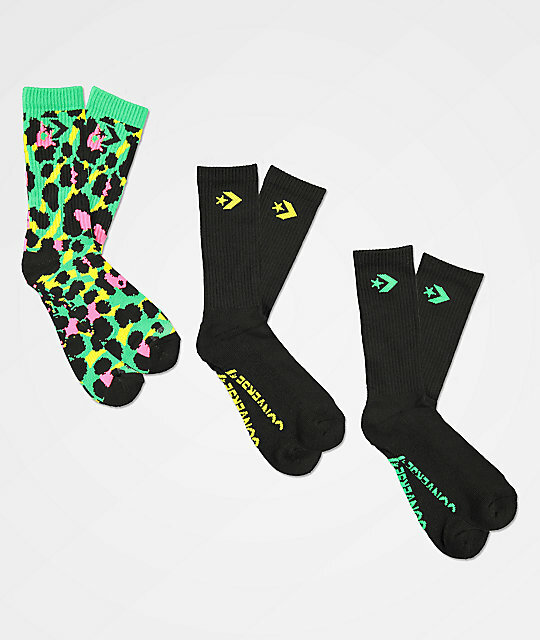 Outfit your feet in wild style and classic branding with the Converse Palm Leopard Acid Green & Black 3 Pack Crew Socks. These socks feature cushioned foot beds and arch support for comfort, while the moisture wicking construction keeps your feet dry from the skate park to the gym. Complete with three pairs, one with vibrant leopard print and two with script logos at the arch, these socks are a strikingly original way to show your love for the shoeware giant Converse. Palm Leopard Acid Green & Black 3 Pack Crew Socks from Converse. 3 pairs of socks included. One pair neon leopard print, one pair black with yellow logo script and one pair black with green logo script. Jacquard knit Converse logos at upper cuff. No-slip heel for improved fit. Moisture wicking construction for comfort. Fits Men's shoe sizes 6-12 | Women's shoe sizes 8-13.